My only resolution is to meet my dear twitter friends in real life. Happy New Year to my PLN! I was tagged by Shelly Terrell in her wonderful challenge to write about our most inspirational educators. German was my first foreign language. I studied it for 5 years before other languages came along. These days, however, it's all about English. At school, out of 21 classes that I teach per week only two are German. I write my blog in English, I google in English, I tweet in English, I sometimes communicate with other German teachers in English. However, the most inspirational educators who have deeply influenced me belong to the German side of my education. Mr. Kazimir Sviben was my primary school German teacher. It was him who opened the door to the amazing world of foreign languages. He was one of the first multitaskers and lifelong learners I have ever met and he always encouraged us to pursue our dreams. His teaching instilled a love of languages in his students, many of whom became language teachers later on. We're famous in Croatia today. There are articles about our achievement in the papers. As far as I know, we're the first school in Croatia to be recognized with the Edublog Award, so that's why it is called the Educational Oscar. The proud nominees for the Best Educational Wiki. I've just read a post about a blogger who is going to decline his nomination for the Best Individual blog 2009 because he knows the worth of his work and his readers' daily comments and reading are affirmation enough. I guess it takes all kinds to make a world. I'm the complete opposite. I don't know what I'm worth. I'm an ordinary teacher teaching ordinary students. I need nominations to show me which way to go. I deeply appreciate it when my colleagues tell me I'm doing my job well. I cried when I saw the nomination for my wiki. I immediately tweeted about it, published it in my Facebook status, wrote a blog post, sent emails to all my contacts and called my friends. Thank you Eva, Valentina and Karenne for nominating my wiki project Greetings from the world. Thank you Edublogs judges for shortlisting it. My heartfelt thanks to all the members of the wiki who created such amazing glogsters. You're awesome!!! If you feel like voting, just click here. 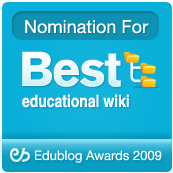 talk.ed is nominated for the Best Educational Use of a Social networking Service. Monika and her webclass definitely deserve this award because they help, they encourage, they support.... they care!